Carl Fox always wanted that sweet destination restaurant where you could spend an afternoon hanging out with cold beer and great food. Designing the resort, we realized we had the ideal place to build dream. Somewhere loved by guests, locals, and yachtsmen just passing through. Welcome to the Salty Fox Bar & Grill. The Salty Fox is the open air restaurant at Taveuni Dive Resort. It’s spacious, right next to an incredibly infinity pool with a nice view of the Somosomo Strait. We built a place that felt just right – whether you are hanging by the pool after a day of diving, or having a formal occasion like a wedding (or maybe having the Fijian Prime Minister stop by). Our guests want great tasting food and awesome service. Whatever your preference, the Salty Fox Bar & Grill caters to your tastes. Our restaurant offers a mix of modern, local, Fijian dishes alongside your favorites. We cater to guests with special dietary requirements like vegetarians, people with food allergies, and those with gluten sensitivities. Just be sure to let us know before you arrive, so we can plan something special for you! Each morning guests have the choice of cooked to order breakfasts, or cold items such as fruit or cereal. Our guests usually order meals such as eggs, omelettes, pancakes, french toast, hash browns, oatmeal, cereals, yogurt, and fresh fruit platters. Drinks include a range of teas, coffees, and other beverages. 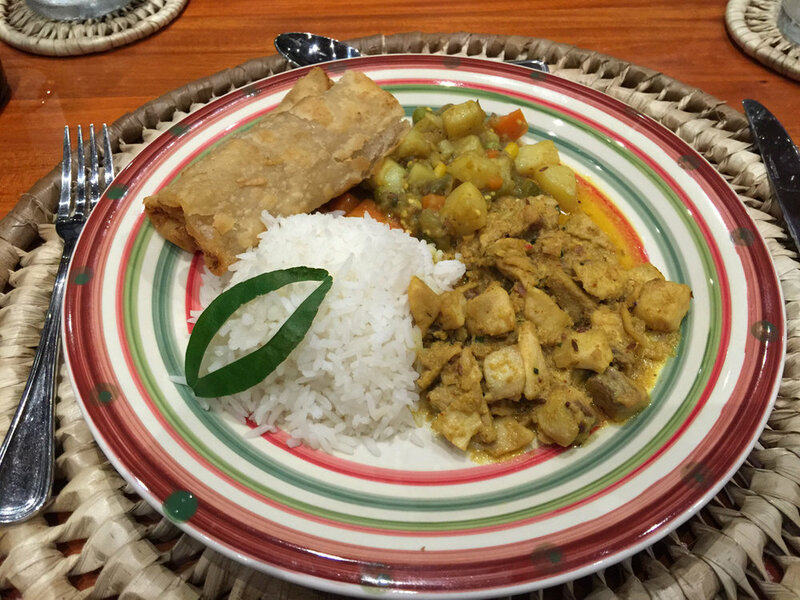 Given Fiji’s multicultural history, local cuisine includes a wide range of flavors and styles. Traditional dishes rely heavily on root crops such as taro and cassava, leafy greens, fresh fish, coconut, and peppers. Indian influences contribute meatier curry dishes, breads, chutneys, and sweet treats. Other Asian influences also contribute, meaning there is always a new flavor or texture to be experienced. Our daily dinner menu will be posted in the morning, and is geared to the tastes of the guests staying at the resort. The Salty Fox has a comfortable bar menu filled with western favorites like pizzas, burgers, fish, and sandwiches. One of those dishes that customers rave about is the “Salty” Burger. Our signature burger is made from the best beef flown in every week from Suva, cooked to perfection on the grill and topped with a choice of crispy bacon, tasty cheese, or even a local organic fried egg. Served with fries and garden salad. How about the pizza? We spent months perfecting our pizza recipes, and we think you won’t find a better pizza on the island. Need a snack or nibble? The restaurant has a great selection of snacks to tide you over between lunch and dinner. Beverages include soft drinks, ice tea, juices, beers (our mainstay here is Fiji Bitter and Fiji Gold, though we also have Vonu Lager and some others), and a full bar. What do our guests say about our food? Wonderful food. Amazing location!!! The sunset views are wonderful. The pizzas are all great. Perfect meals everytime! Compared to most of the other eateries on the island Salty Fox is refreshing. The vibe for us has always been very clean, very chilled. Food & Drinks menue is simple, affordable with satisfactory portions. I'm a pizza kind of girl. I've tried all their pizzas, each winning my vote of confidence. My favourite though is their vegetarian pizza. At Salty Fox they don't hold back on your choice of toppings, they even customize your pizza base to your liking, whether it be thick or thin which is an additional bonus for me as some places don't even offer that. Marcus on the other hand is a burger enthusiast, so watching him devour his beef burger with very little room for conversation clearly had his stamp of approval. His burger came with a big serving of fries, just the perfect amount of golden crisp. Which brings me onto food. All the food tasted great and with a new special everyday you could easily work your way through the menu in a week and not repeat dishes or get bored. They will also bend over backwards to accommodate your food preferences - want extra or something or to swap an item, no problem, no issue, no fuss. The staff in general were genuine and after 10minutes knew all the guests name - what great service. Just spent 6 days at this wonderful resort. We did not dive, but did go snorkeling and it was amazing. The food was the best we had in all of Fiji. The kitchen staff was brilliant. They prepared several off menu meals for us including one of the best fish curry dishes I have ever eaten.